George Catlin. 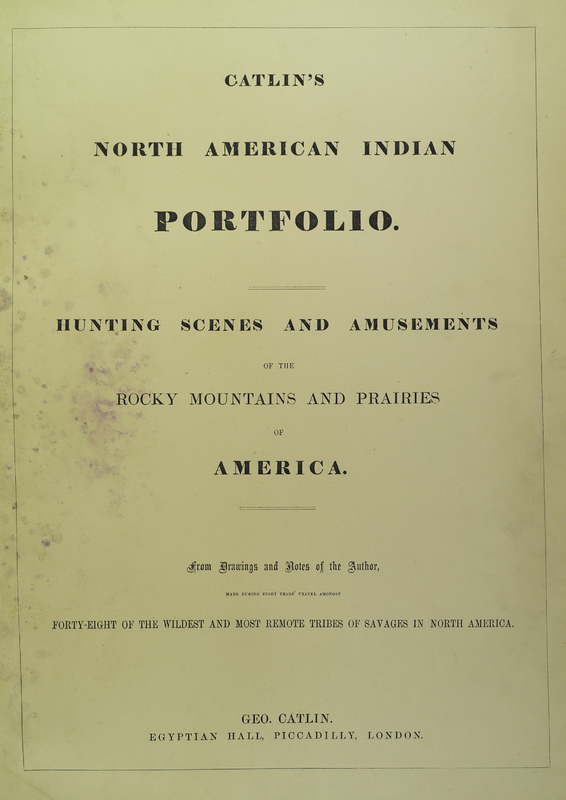 Catlin's North American Indian Portfolio: Uniting Scenes and Amusements of the Rocky Mountains and Prairies of America. London: Geo. Catlin, Egyptian Hall, Piccadilly, 1844. George Catlin (1796-1872) was an American painter, author, and traveler who specialized in portraits of Native Americans in the Old West. He was born in Wilkes-Barre, Pennsylvania and spent most of his career traveling among the native people of North, Central and South America where he sought to record the appearance and customs of America’s native peoples first hand. Beginning his journey in 1830 with William Clark on a mission up the Mississippi River into Native American territory, Catlin ascended over 1800 miles to Fort Union Trading Post near the North Dakota/Montana border where he visited eighteen tribes, including the Pawnee, Omaha, and Ponca in the south and the Mandan, Hidatsa, Cheyenne, Crow, Assiniboine, and Blackfeet to the north. It was among these peoples that he produced the most vivid and penetrating portraits of his career. 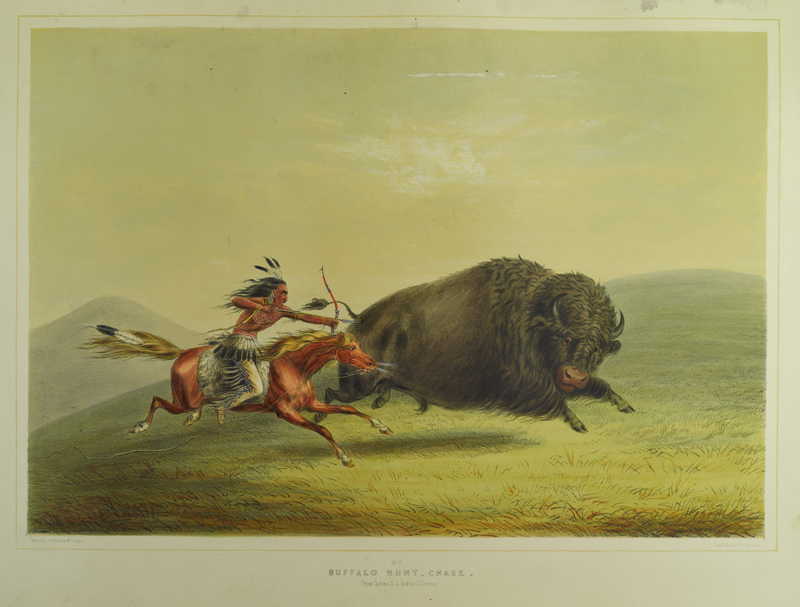 This illustration depicts a native hunting a buffalo with a bow and arrow while riding a horse. The native is wearing traditional clothing for Native Americans of the plains. 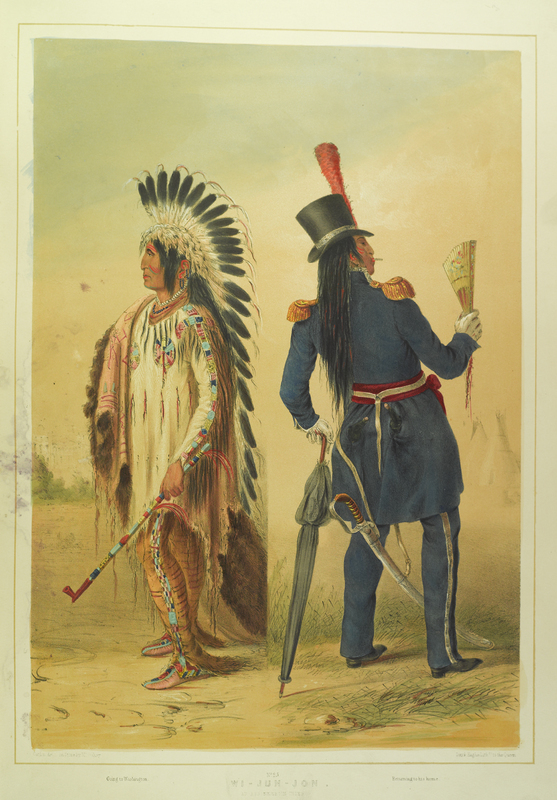 This next illustration characterizes the drastic changes in clothing and culture an Assiniboine chief named Wi-Jun-Jon experienced after returning from a trip to Washington D.C.